Beat a strong monster? Accomplished a new level? Lost to some lame monster? Did something you think is just awesome? Here is where your place your achievements. ACC: Got to Level 5! Post all of them here and only here. There are a few rules for this thread. No questions or idle chit chat. Use only links for pictures. The =AE= Comprehensive Forum Rules APPLY here. ACC: I completed the Bladehaven storyline the same day it came out! ACC: Completed the game and got to level 10. DIS: Only four or so achievements to get. I am Gold, for I am many. DIS : Get very annoy and decided to quit for a while. Acc: Just beat the Undead Queen, level 4, level 3 weapon. Dis-Accomplishment: Can't be bothered farming to level ten right now. Probably get it done tomorrow. Accomplishment:Paladin Shield and Kings sword! Dis-Accomplishment: Don't have enough money for the Shadow sword. Dis-Accomplishment: Really don't wanna farm for it. 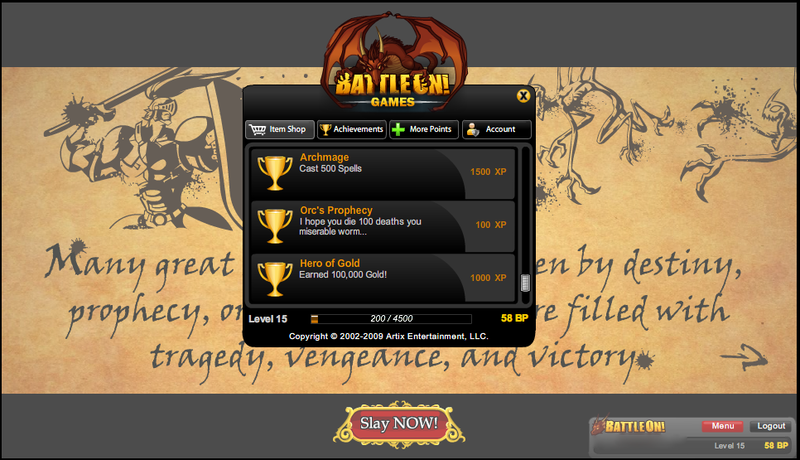 ACC: Level 10 in a couple hours and beat the Storyline several times. ACC/DIS: Have 29 Achievements, but need the the rest. DIS: Won't get two achievments due to me having less than 10 wins, and having no plans to lose. DIS: The Dragon Boss is too hard for at the moment. ACC: Bought almost all Upgrades, need just the HP one and I'm done! DIS: 2 more Lvls to go..
ACC: Made it to Level 10! DIS: Gotta grind for the 100,000 Gold and the spells and the deaths and the blocking for the last achievements. DIS: Going to take forever to get 100K gold and get to level 10. ACC: Got the Toughness and XBoost thingy tew! DIS: Achievements should be at 29/31 given the information from my stats, but instead 26/31. Acc: Defeated whole game without a single Permit. DIS: Have a problem with slashing. DIS: Not a lot of time to play the game, but it is a mini-game after all. DIS: Need 60k more gold. DIS: Gonna play this again when it isn't so glitched. ACC: Woot, All 31/31 achievements Complete. ACC: Beat the orc boss! BIGGEST DIS EVER: I logged out after saving my game, came back EVERY SINGLE THING erased, says when I load, your character already loaded and shows a level 1, no equipment, OMG!